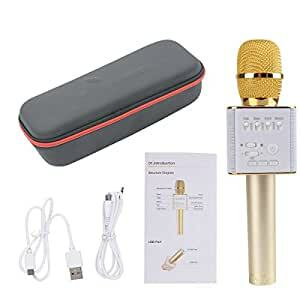 PORTABLE KARAOKE MICROPHONE – Handheld Wireless Karaoke Microphoneï¼mini Karaoke Machine for Music Playing and Singing at anytime.Compatible with the music APP softwares of most Andriod and IOS System smartphones,Support external USB mobile U disk fuction. KTV ECHO EFFECT – the highest quality chipset with two channel stereo Microphones,more stunning KTV live-sound,more clear music rhythm with echo reverberation. EASY TO OPERATE – Multi-function buttons can set the treble, bass, reverb, accompaniment, playback volume. Free to modify the previous and next song. MULTIPURPOSE – the Best Wireless Karaoke with bluetooth speaker, KTV singing, Gathering singing, Family singing, Travel singing, Car Stereo, Instrument Recording, Interviews and Live etc.